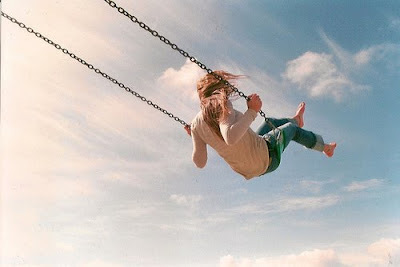 As a little girl I loved going to the park to play on a swing set. Trying to go higher and higher. The wind blowing in face as I was flying through the air. The swings were my favorite thing on the play ground. Today my love for swings has grown with me. I love an inviting porch with swings. I could easily spend hours outside on a beautiful day sitting porch swings catching up with a good friend or chatting with my sisters. 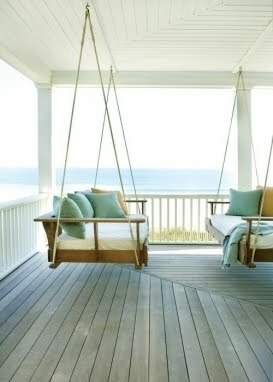 I'm not sure that beach houses would be as wonderful and special as I imagine without a beautiful porch swing. I love how the wood on these swings seems very natural and the color of the pillows plays off the color of the sand and ocean. I would love to be out on these swings watching the sun rise or set. 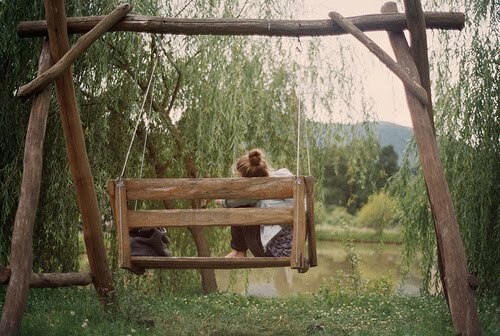 My favorite thing about this swing is its rustic, homemade feel. I can picture a swing like this on a beautiful farm or at someone's getaway cabin. It would be a perfect place to sit and admire the changing leaves in the Autumn. I also have a little of a fascination with indoor swings. Does anyone remember the indoor swing in the movie Penelope? The swing pictured above is very chic. I love the pattern it has and how it plays off of the colors of the wall and carpet. These two indoor swings are wonderful focal points of a room. And can you imagine the hours and hours of fun they would provide? swings were always my favorite playground past-time too! my parents have a big barn on their property and they hung swings inside, so you can swing rain or shine! oh i love those. we always play on the kids swings at camp. i always wanted a bed that was hung like a swing set. Such a cute post, I really want a swing in my room now..! I love, really a sense of harmony. Ah, swings can just be so romantic. Definitely having one in my future house. P.s I have a new post! I looovvve swings, too! They were my absolute favorite as a kid. I love this post! 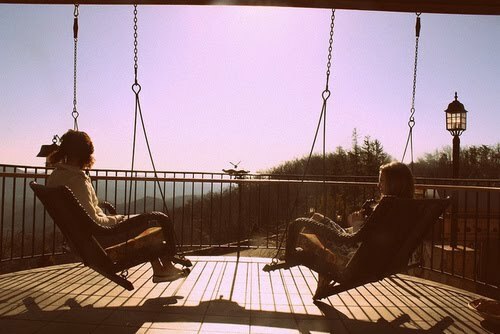 Swings are so lovely, and I have never even considered having them in the house. But what a wonderful idea!